November 19, 2015 – Engineers developing Orion’s thermal protection system have been improving the spacecraft’s heat shield design and manufacturing process since the vehicle successfully traveled to space for the first time last year. They are now enhancing the overall system in advance of the spacecraft’s next mission – a flight that will put Orion through the harshest set of conditions yet. Orion’s thermal protection system is one of the most critical parts of the spacecraft and is responsible for protecting it and the future astronauts it will carry home from deep space destinations. It consists of the spacecraft’s main heat shield that faces into the atmosphere on reentry to slow the spaceship down and also the grid of tiles known as the back shell. During Orion’s next mission atop the agency’s Space Launch System rocket, called Exploration Mission-1 (EM-1), the spacecraft will be in space for more than three weeks and return to Earth under even faster and hotter conditions than during its last flight. During EM-1, Orion will endure a more intense re-entry environment. While the spacecraft encountered speeds of 30,000 feet per second during its test last year – Exploration Flight Test-1 (EFT-1) – and temperatures of approximately 4,000 degrees Fahrenheit, it will experience a faster return from lunar velocity of about 36,000 feet per second. While the speed difference may seem subtle, the heating the vehicle sees increases exponentially as the speed increases. The work engineering teams across the country are doing prepares Orion’s heat shield to perform re-entry during any of missions planned near the moon or in high lunar orbit (NASA’s “Proving Ground”) in the coming years. 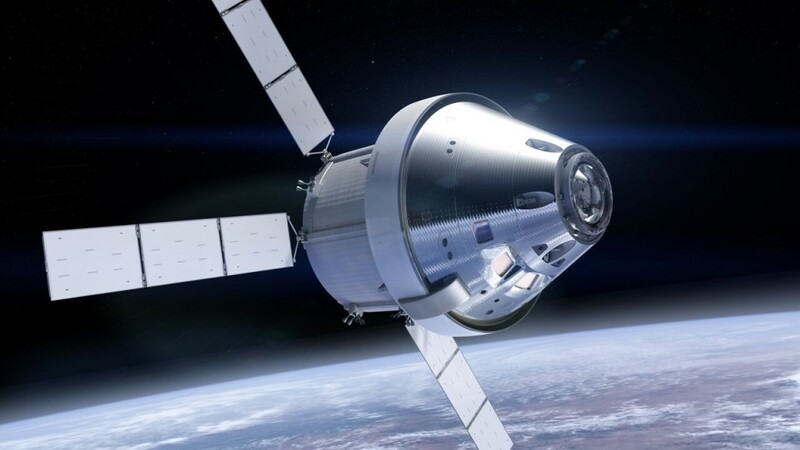 For these future Orion missions, a silver, metallic-based thermal control coating will also be bonded to the crew module’s thermal protection system back shell tiles. 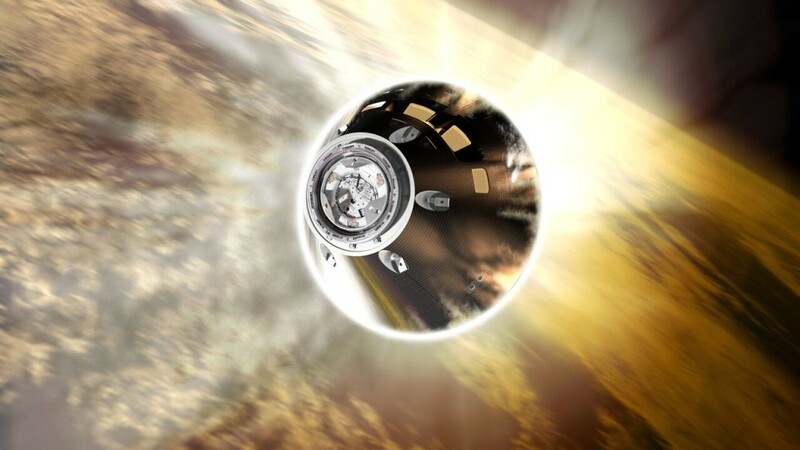 The coating, similar to what is used on the main heat shield, will reduce heat loss during phases when Orion is pointed to space and therefore experiencing cold temperatures, as well as limit the high temperatures the crew module will be subjected to when the spacecraft faces the sun. The coating will help Orion’s back shell maintain a temperature range from approximately -150 to 550 degrees Fahrenheit prior to entry and also will protect against electrical surface charges in space and during re-entry. “You’re trying to hit this sweet spot because when you’re looking at the sun, you don’t want to get too hot, and then when you’re not looking at the sun and instead in darkness, you don’t want to lose all the heat that the spacecraft generates,” said Kowal. Engineers have also refined the design in ways that improve the manufacturing process and reduce the mass of the spacecraft for the upcoming exploration missions. Instead of a monolithic outer layer, the heat shield will be made of approximately 180 blocks that can be made simultaneously with the other heat shield components to streamline the labor-and-time-intensive manufacturing process. In addition, engineers have found ways to reduce the mass of the heat shield’s underlying structure, which is composed of a titanium skeleton and carbon fiber skin. Teams have optimized the thickness of the skeleton and the skin based on the pressures that different areas will experience during flight and reentry, adding more fidelity to the overall structure while allowing it to be lighter. NASA’s prime contractor for Orion, Lockheed Martin, recently completed a heat shield manufacturing development unit that engineers will use to verify the improved manufacturing process before it is used on hardware for flight. Teams have already begun building Orion’s heat shield for EM-1.